Yes, it is true. I can't believe I forgot to mention it sooner. I am an award-winning internationally acclaimed photographer. Well, that may be taking it a little too far. But I did indeed win an award for a photo. Okay, more of a prize than an award. 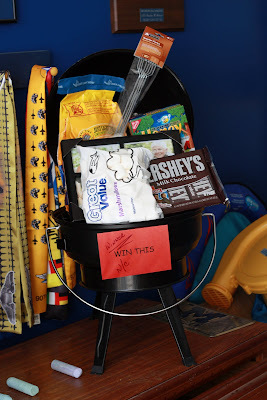 Does a mini-grill with some s'mores fixings count as a prize? And maybe it didn't come with international acclaim. But I do have some friends in Europe & Asia that read my blog, and they will probably exclaim "Hey Erin, good job." I am a mini-grill winning internationally exclaimed photographer. So I entered a photo contest at the local WalMarts (when you read that in your head, make sure you pronounce it with a hillbilly twang). And it turns out that out of the hundreds tens of entries, mine was chosen as the winner. The theme was Father's Day, so I dug back through some picture files, opened up the 'ol Photoshop Elements, and tried to turn an over-exposed picture into something that would work. Frankly, I'm not all that impressed with this picture. I'm betting the real reason I won is because that strange man who works in produce was probably on the judging panel. And when I'm inspecting melons, he's doing the same thing. Anyway, the most interesting fact about the whole thing to me is that, despite being on display for a month, those marshmallows were still soft. Great Value marshmallows just bought themselves a life-long customer. I'm not surprised it won. As a matter of fact, I'm glad you entered. When I showed that photo to everyone at work, they were amazed with your talent. (I of course informed them you had absorbed this talent from your association with your husband's family). But back to your photo. The general consensus was that it was very topical, yet historical. It was the early 21st century's version of that Steinbeck depression era novel, The Grapes of Wrath. Congratulations, and keep up the good work. Hooray for you! I think it's an adorable picture and you did a good job snazzing it up! :) I'm sure you won on merit, not melons! I'm sorry, are you saying that there's a tiny grill you can use to make s'mores? Oh yes ma'am. I like the picture because it looks like Alex is dragging those boys behind her like the little train that could. :) Just kidding. Great picture! And congrats! What a fabulous shot! I need to get me some Photoshop Elements. Of course, I need to become a better photographer too :) You really could be a professional. I LOVE your photos! You are sooo funny. I miss your wit. Congrats on your big break. :) Mountain Home and Altus sound one in the same. I think you take lovely pictures.